In books based on food sciences, and particularly in those related with the topics of human nutrition, it is recommended to consume fruits and vegetables every day, which are the basic axes of the Cretan diet. Why? Fruits and vegetables are rich in vitamins and mineral nutrients, which are necessary for our alimentation. For fruits and vegetables to be rich in vitamins and mineral nutrients, it is necessary for plants find nutrients in the soil where they are grown and cultivated. Besides, for good health of plants and trees, it is very important for the soils to contain sufficient quantities of micronutrients for their harmonious growth and development, as well as for an abundant production of fruits and vegetables. This book in the sciences of agriculture and environment contribute to a better knowledge of the role of micronutrients in plant nutrition. What are these micronutrients, how can we extract them from soil in order to determine their concentrations, why does their deficiency in soils cause problems in plant growth and development, why fruits and vegetables’ production is closely related to soil nutrient concentrations? Are there solutions to alleviate micronutrient deficiencies, which are the tools used by agronomists and agriculturists to face a micronutrient constraint in soil and significantly increase yield production, as well as to ameliorate the quality of fruits and vegetables? What is the strategy that could be used to orientate the conventional agriculture to an ecologically viable agriculture for a sustainable development? The responses to all these questions available in the excellent e-book, written by Dr. Theocharis CHATZISTATHIS, investigator in the school of Agriculture, Forestry and Natural Environment, Aristotle University of Thessaloniki, Greece. This book based on 9 chapters he describes first of all the ‘Micronutrient Solubility and Availability in Soils’, followed by ‘The Role of Micronutrients in Plant Metabolism & Growth and Diagnostic Tools to Assess Micronutrient Deficiencies’. Afterwards, seven necessary and most important micronutrients for plant growth are presented in different chapters in a very didactic way, which offers to the reader the pleasure to discover them, and in parallel to explore the necessary tools to answer different questions, which could be presented in different situations. This is why the micronutrients like Iron, Zinc, Manganese, Copper, Boron, Mollybdenium and Chlorine are presented based on very important, up to date, bibliography. For all the reasons mentioned above, I strongly recommend the study of this e-book not solely to undergraduate and postgraduate students, but also to doctors, researchers, as well to the teaching staff of Agricultural and Environmental Sciences, because it will provide them many answers to very important questions in order to better understand the function of an ecosystem, and particularly they will be able to approach the questions of plant physiology with a different perspective. Despite the fact that micronutrients are found in very low concentrations in plants, their importance for crop production and plant metabolism is very high and their supply should not be neglected in an integrated fertilization program. They are as essential for plant cycle as macronutrients and the inadequate levels of even one of them may seriously disturb plant metabolism and different characteristic and non-characteristic symptoms may appear. The lack of micronutrients may disturb photosynthesis, auxin levels, N, carbohydrates and protein metabolism, chlorophyll content, capturing of atmospheric N and many other physiological and metabolic functions of plants. This e-book aims at presenting and analyzing the problems caused in crop production by micronutrient deficiencies. The necessary plant growth micronutrients, their mobility in soils, their role in plant metabolism, as well as the deficiency symptoms and critical concentrations are discussed. 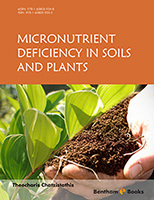 In addition, the soil factors influencing micronutrient availability are being presented and, finally, some of the most important mechanisms adopted by plants to survive under micronutrient deficient soil conditions are included in this e-book, under the light of the most important and recent research data. I really believe that this e-book is a useful tool for MSc and PhD students, as well as for academic personnel and researchers studying mineral nutritional problems in agricultural soils and crops. Furthermore, it may provide valuable information to the farmers, giving practical solutions to some topics concerning micronutrient deficiencies and their alleviation, such as fertilization and amendment practices.